MPCNT-Basic benchtop carbon nanotube synthesizing apparatus. 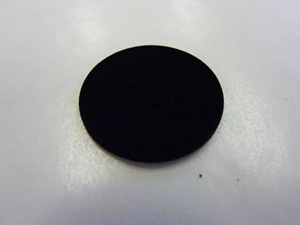 Carbon nanotube synthesizing apparatus is simplified by using ethanol as the carbon source. Also you can also use organic liquid methanol, xylene, and benzene. Ethanol is a very convenient material for the generation of carbon nanotubes. Highly crystalline CNT SWCNT and is likely to be generated. Moreover, in order to decompose at a lower temperature than hydrocarbon gas, strongly reducing action of the metal, can be used as a catalyst as powder material (Fe, Ni, Co, SUS, NiCu ...) a variety of commercial production process of carbon nanotubes You can be more conveniently. 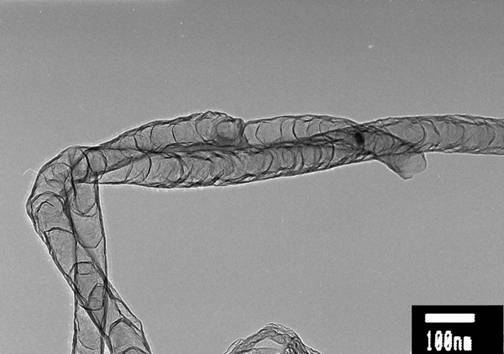 Vertically aligned carbon nanotubes can be grown with high crystalline various substrates (silicon, quartz, stainless steel, metal, ceramics, etc.) and, on the carrier. Easy, the entire process can be completed in just 20 to 30 minutes may also want a compact size. In addition, the use of transparent glass chamber, you can visually instantaneous generation CNT. 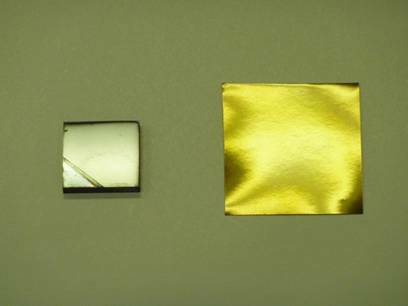 Incidentally, the CNT grown orientation, it is necessary to exclude the alloy substrate such as Ni and Fe some generally keep pre-catalyst film deposited on the substrate sample. I can provide the substrate with the catalyst film as consumables from us, you can also catalyze the deposition film forming apparatus in your own. 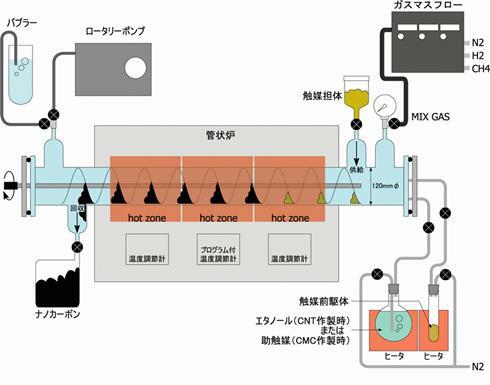 Also, if you wish, a self-contained system to CNT growth from catalyst formation MPCNT-Premium and multi-function vacuum deposition apparatus we are recommended. 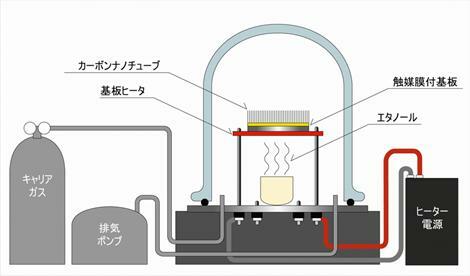 It is a CVD apparatus is heated in an atmosphere of ethanol under reduced pressure to a substrate with a catalyst prepared in advance, the synthesis of vertically aligned CNT. Moreover, if placed on the heater and heated powder catalyst, CNT powder type is generated. CNT grown directly on alloy NiCu. the deposition of the catalyst is not required in this case prior. 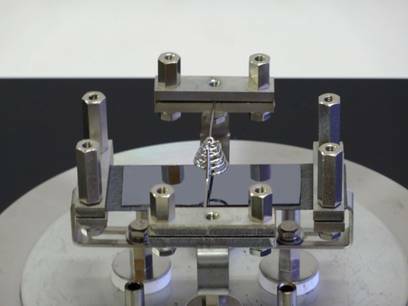 CVD is a surface treatment apparatus equipped with a compact tabletop (hot wire) hot filament. 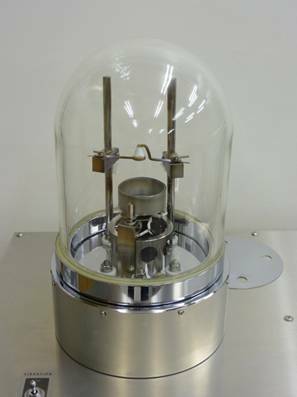 Can be heated to up to 2000 ℃ W filament near the sample provided, I will promote the decomposition of various reaction gases. Film is formed (radical) is deposited on the sample surface active species generated by the decomposition gas. 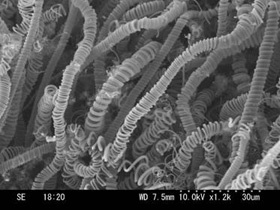 (DLC) film can be produced diamond-like carbon filaments by high-temperature decomposition of hydrocarbon gas such as methane, both conductive and corrosion resistance. By degrading heated by heating mechanism filament precursor nitrogen, you can while in situ ammonia gas, heated to a high temperature the material various substrates, and the nitride or nitrogen doping. Since it does not require preparation of ammonia gas cylinder, you can experiment without selecting a location and environment. cylinder, you can experiment without selecting a location and environment. Nitrogen-doped CNT obtained by nitriding treatment of the carbon nanotubes. Change in the shape of a hollow tube-shaped bamboo from the crystal structure of the CNT. MPVAP-powder multi-function vacuum deposition apparatus. 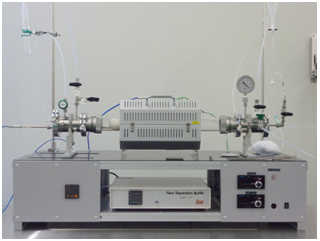 This vacuum vapor deposition apparatus for coating various metal thin film on the surface of the sample of granular and powder type. By allowing the evaporated down from above the evaporation source, we have to allow the deposition of particulate samples can not be fixed. Equipped with a vibration sample stage our idea, you can be deposited while rotating the sample vibration. The rotation of the particles deposited uniformly on each side is possible particles, plaque deposition can be significantly improved. 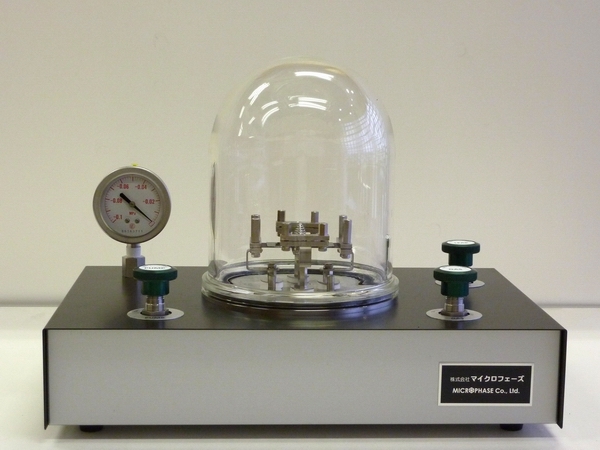 It is also possible that your existing vacuum deposition apparatus, the evaporation crucible mounted upside down and incorporate our vibration sample stage, please feel free to contact us. CVD is generating apparatus using carbon nano (75mmφ) quartz tube furnace 3 zone independent temperature control of the heater. High temperature uniformity, less plaque generation. 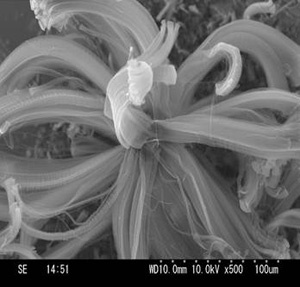 Generation and the deposition of carbon nanotubes, various carbon nano-coil, carbon micro coil, such as graphene is possible. I comprises introducing mechanism outside of the catalyst precursor. Can be grown CNT while supporting the catalyst, the carrier silicon, quartz, ceramics, or oxide, the catalyst is no longer necessary adjustment separately. (CNT composite material having a structure of highly dispersed core shell matrix CNT / CNT composite materials see us is useful in the development of). Provides a mechanism for ethanol evaporation, the system introduced ethanol, ethanol vapor can be introduced. It is effective for the generation of SWCNT. 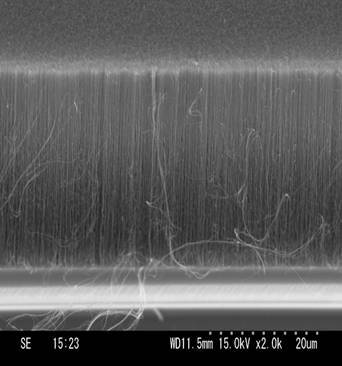 In addition, by introducing ethanol vapor instead of to introduce steam generating cocatalyst CMC, you will be able to generate efficiently carbon nanocoil carbon microcoil. CVD carbon nano generation equipment using quartz tube furnace (120mmφ) large-diameter three-zone temperature control heater. Orientation of the substrate and is best suited for large-area CNT, CNT type to generate a large amount of powder of high yield. 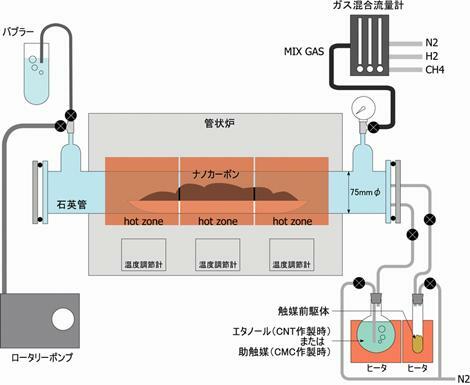 Hydrocarbon gas introduction to the system, equipped with a precise mass flow control system. Introduction to the system ethanol was prepared prior evaporation function. And a screw rotating mechanism provided inside the quartz reaction tube, we have continuous or intermittent to allow generation of the CNT and the recovery mechanism of the CNT external deployment mechanism catalysts and catalyst supports have been generated.